Mumbai: Bankers agree that all Indians should have an account. Yet, many millions of people in rural areas still deal in cash, and many others in both urban and rural areas have not done more than extracting cash out of automated teller machines (ATMs). Reaching out to the unbanked, a process called financial inclusion, involves innovative models and the use of technology. But banks have to strike a fine balance between reaching out to areas where the returns are not immediate, and making reasonable gains. Is there a method to do this, and are banks the only route to financial inclusion? How can technology help in taking banking to the masses in a meaningful manner? Anil Jaggia: It is no secret that most accounts, opened in their current form, are not financially viable. Unless you have a minimum balance of ₹ 2,500, assuming you make a 4-5% spread on the account, there is no way to break even. Banks need to find innovative ways to at least not lose money and then work towards making a reasonable financial gain, failing which, this (financial inclusion) will never become a mainstream activity. So we should leverage another’s distribution network. Hence, we launched an initiative with Vodafone, where we leveraged its distribution channel, down to their retail point. Now we have a human being who is effectively a mobile mini bank branch with a handheld device. The villagers know this person will be there at a specific time. There is no biometrics involved, just an ATM card with a PIN. The figure now is around ₹ 32 per account, which may just work for us. Pravir Vohra: This is not a new issue. The problem hasn’t changed but the technology has improved. The problem is that you need physical presence and to make this viable, we need volumes. We’re concerned about the BC model because of the risks that it injects into the system. So we’re opening ultra-small branches which are between 100-200 sq. ft. And they will work for certain hours of the day on certain days of the week. The challenge is of handling cash. Technology can solve most problems until you bring in the physical aspect— when you need to deposit cash or withdraw it, which is a challenge the nation, and not just banking, faces. It’s fairly easy to concentrate on 20 districts and saturate them, but I think at some stage meaningful banking will revolve around marrying the deposit reliability and lending strategy with the ecosystem where you can recover your money and contact your customers. Deepak Chandnani: The objective is to bring people into the formal financial system. Why must it be through a bank account? Around the world—Africa, Far East, the US—they are bringing people into the formal financial system through prepaid accounts that are not necessarily launched by banks. If you want to bring in people that have low incomes and small savings and say “I’m going to open a savings account for you and I have to make money on that money you save", the proposition is not going to work. If you can earn on what they spend, then it is a viable proposition. Uttam Nayak: The cost of transaction has to be kept low so you have to switch from the physical form factor of a card to having a prepaid account on a mobile phone or the Internet. But the biggest challenge that the country faces for all socio-economic segments is acceptance development. So making money off transactions is the key. Today the country has 250 million credit and prepaid cards, but these 250 million people use the card only once a year. That’s the lowest in the world. We have to work together to create an acceptance network and an ecosystem of secure reliable payments. 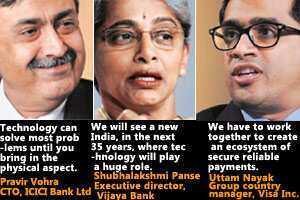 You need to have one big public network such as Aadhaar that Nandan Nilekani is trying to set up. This cuts across socio-economic barriers to put everyone on the same level. Shubhalakshmi Panse: We started with opening a no-frills account, but realized it was not really generating business. Then we looked at credit linkage but these were people who were coming into the banking fold for the first time and we needed to make them understand the basics of banking. Pradeep Kumar:SBI has been given the largest responsibility to take banking to 12,000 villages in areas where nobody is willing to go. We currently have more than 13,000 branches. We cannot open that many more branches so are using the BC model. Various technologies are being tried out. We have more than 40 lakh no-frills accounts where the average balance must be ₹ 150-170. So I don’t think we’re going to make profit on that model. But the government is keen on directly crediting the beneficiary’s account for subsidies, for NREGA (National Rural Employment Guarantee Act) payments. This we hope, in the long term, will increase the balance in the accounts from 100s to four figures but still not to the ideal ₹ 2,500 for the next four-five years. Alok Shende: Concepts like banking, saving and credit were taught to us by our parents and through formal training. The audience that we’re talking about, has no such benefit. It’s a little far-fetched to assume that people who have no such background suddenly come and be part of the system. We’re also talking about people who have cyclical incomes and for them to save and bank is a different proposition. I’m not sure the banking industry is taking cognizance of this and developing a solution or product that will develop a long-term relationship. Why do banks say that adopting a core banking system (CBS) has raised their non-performing assets (NPAs)? And where do you see technology headed five years down the line? Panse: Earlier we had the flexibility and knew our customers. With core banking, this has changed. Now on the 90th day if the payment is not made, the system identifies it and makes it an NPA. After it becomes NPA, until the customer pays the three instalments, the account cannot be upgraded. Earlier, we had the flexibility of altering this manually. A couple of developments are taking place—one is Aadhaar, second is NPCI (National Payments Corporation of India), and third, as far as all government employees are concerned, all payments are coming directly to the credit, so that aspect of cash has been taken care of. Now for a lot of schemes the payments are going to go through the banking channel and this will increase the amount of cash in the system and we will see a new India, in the next three-five years, where technology will play a huge role. Chandnani: When you look at the next five years, I’ve seen banks adopt technology and use it well, but they are not the greatest innovators when it comes to doing new things for new customers. Bankers have been more conservative, maybe because the payment and banking system needs to be more conservative. In most countries in Africa, the percentage of banked population is between 5-15%, at least in our country it’s 50%. Even 25% of the US population is not banked—80 million people. In some of these places you have the benefit of national identification cards like in Kenya, or social security numbers, like in the US. That’s going to take some time to happen here with Aadhaar. The regulator is in the right place and there are great initiatives that are being taken and the technology available is excellent but the adoption by bankers and level of innovation is low. Jaggia: On technology in banking, we benchmark ourselves to the best-of-class in the world and invest significantly in technology. I think the banking technology we have is as good as it gets worldwide. In terms of where the banking space will be, if we talk of the bottom of the pyramid, there will be many people who will use the bank and they will use handheld devices to access it. Clearly getting from one place to another even in the cities is getting more expensive. Cash will come down and there will be e-money. Kumar: With regards to adoption of technology, a bank like us which has a wide spectrum of customers from different socio-economic backgrounds has days where we have more than 10 million hits in our ATMs. The Internet is one-third of the ATM which is very surprising. We have all kinds of customers, but adoption of technology will increase manifold. The mobile phone will ultimately become the device of the future. Regarding NPAs, I don’t think it’s because of core banking, it’s because of standardization. 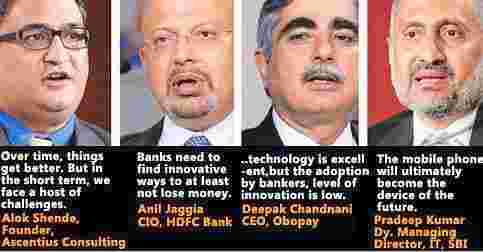 Vohra: I think banks in India are trying to innovate and at times have done so ahead of our time. Nayak: The government is the largest handler of cash. The government has to adopt technology in a big way, set an example and create the ecosystem for cashless transaction. You’ll drive transparency, accountability, lower cost and efficiency. Research shows that GDP grows by 0.5% a year by eliminating costs of handling cash. Also the customer needs to understand that as more cash is eliminated from the system, the more money in his accounts, which means more savings and higher interests. Shende: Business processes are an important concern when it comes to the adoption of technology. There is a human element that works in tandem with this technology to deliver this service, and it takes time for these two to work in cohesion. Over time, things get better. But in the short term, we face a host of challenges. Is the regulator an impediment at times? Jaggia: There are regulatory guidelines that apply to all banks and we are part of that system. Every bank, whether private or public, is a local Indian entity and we want to do our bit. Technology is not the main factor whether in terms of cost or innovation. It is really the business models that have to evolve which leverage this technology. I don’t think we’re being driven today by targets alone. It’s really a desire to make a difference that most banks have, but we want to do it in a sustainable way. Panse: Anything that is taken on such a massive scale has to have a top-down approach. Once the regulator has stepped in and put it in place, it is the implementation stage. I would divide this entire financial inclusion in two major parts. One is villages above 2,000 population. These are typically villages which have the basic infrastructure and are located near cities. The real challenge is going to come next year when we go to very remote areas where the population is below 2,000 and technology has not reached these areas. This is where innovation is going to pose a real issue. Vohra: We’re all Indians, I think social inequality is a big challenge for all of us. The job of bankers is to contribute to the upliftment of society. The regulator is very reasonable and we need to understand the role these entities play.